The District of San Francisco New Orleans’ Lasallians Without Borders Committee (LWOB) has chosen the 2015 work, In Our Backyard: Human Trafficking in America and What We Can Do to Stop It, by Nita Belles as its 2018-19 “One Book, One District” selection. 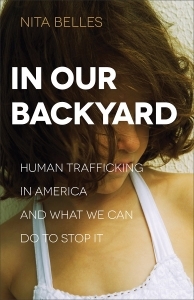 In this unsettling and educational book, domestic violence and human trafficking expert Belles addresses the reality that human trafficking is not a phenomenon limited either to developing countries or to runaways or otherwise vulnerable youth. Drawing from her extensive experience, she educates readers about the forms and risk factors of human trafficking in the United States, as well as how to become involved in its prevention. The selection’s subject matter also dovetails with this year’s SFNO Lasallian Youth Assembly (LYA) theme, Hidden No More: Shedding Light on Human Trafficking. Launched in 2016, LWOB’s “One Book, One District” initiative invites SFNO schools to participate each year in the guided reading of a specially-selected book that focuses on current issues concerning social inequity and human dignity. LWOB specially designs curriculum resources for use with both students and adults for critical reflection on the presented issue, as well as possible action steps that can be taken as a response. Previous “One Book, One District” selections were Enrique’s Journey by Sonia Nazario (2016-17) and Just Mercy by Bryan Stevenson (2017-18). Visit the LWOB Committee Page.